I've built up and torn down a few fixes in the last five years. And I mostly enjoyed my time with them--when they were together. Seems that somehow other projects have always enticed me to cannibalize parts from the fix. I don't think I've had a fix together for more than a couple months before I needed something off of it. Well, times change. I recently moved to Burlington, Vermont and soon saw that the fix was in! Everywhere I went in last fall I saw men and women riding fixed gear bikes. I knew it was time to think about building another one, but with Canadian winter weather incoming, patience was going to be needed. My father was a big touring cyclist. I know he logged over 200,000 miles. Sadly, when he turned 79, his health declined and, after a last "off" year--only 3,000 miles--he finally gave up riding. 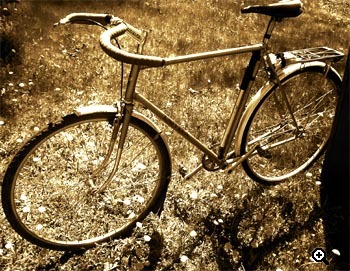 His last decades on the road were on a Panasonic touring bike, but prior to that his favourite mount had been a Univega. He put in over 100,000 miles on that Univega before it cracked. Years after the switch to Panasonic, somewhere in the late 70s, he met a Univega representative at a cycling event. Hearing about the failed frame and the many miles it had travelled, the Univega guy offered up a warranty frame. My dad built up the new Univega frame with his old group but found he preferred the Panasonic. Consequently, I think this bike sat in the garage for 20 or more years. He hardly rode it but for a few short tours of three or four days. When I arrived here in New England last fall, he gave it to me. Being mostly a trail rider, and having a custom built trail/cyclocross bike already, I wasn't really sure what to do with the Univega. It had narrow drop bars, a touring triple 28-38-46, and (ugh) 27" wheels. It had a five speed touring freewheel with crappy stem mount shifters. Not my kind of bike. However, it had some good things going for it: fenders, a bolt-on derailleur hanger, and paint with a nice aged patina. On top of that it fit me perfectly, it was made from lugged steel, and it was hand-brazed in Taiwan during one of the good spells! Working with it that first winter, it became obvious that this bike was going to have to be a fixed gear conversion. I was a little vexed. Having made quite a few singlespeed conversions--plus a couple of fixes--I was painfully aware of the roadblocks which can affect such a job. I really didn't want to have to buy too many parts, as I already had way too much invested in bikes. Horizontal drops (forward facing) with over an inch of adjustment. Essential! Removable derailleur hanger... style points there! Standard reach front caliper brake with easily enough reach to fit a 700c rim without a drop bolt... more style points! 170mm Sugino cold-forged cranks, 100mm BCD with a 38T ring! Strong! Finally the funding grant was approved (by me) at the end of April. I rented a stand at the LBS. At the appointed hour on the fateful day I showed up with the Univega, the front wheel from my cross bike, and a new handbuilt fixed rear wheel (Suzue medium quality 36H, 14g. DT, Mavic MA3.) Oh and of course a credit card! The stripping went very well. Dad knew how to keep up a bike, even if he didn't ride it. Shifters, rear derailleur, rear brake, front derailleur, bars, stem and levers I promptly donated to LBS. Wheels TBA. (I still have 'em, if anybody needs 'em.) Went with an old Weinmann road lever with adjuster and quick release tied on a Nitto 25.4mm moustache bar with 1" threaded MTB stem. I'd like to get a Nitto stem for this. Someday! This generic one works fine though. I put the lever on the right for the front brake..."moto" routing we call that. The 700c cross wheel went in the front and the brake pads easily reached down to the smaller rim. I had to repack the cup and cone BB to move the chainline inward towards the BB. Though this added a fair amount of time, it was well worth it. It allowed me to mount the 38T chainring on the outer position, probably the strongest, and certainly prettier than putting it on the inside of the spider. I coldset the 126mm rear end down on the 120mm hub, then spun on a 3/32" 16T Dura-ace cog and Surly lock-ring. A new Sachs pc-49 completed the drivetrain. No other roadblocks. I set the chain-length to keep the rear axle as far back in the dropouts as possible for tire clearance. I can run 38mm, but currently have a 30mm Kenda micro-knobby 'cross tire on there. The only thing else I had to do was change out the worn saddle for a more appropriate (for me) Avocet O2. Not including the bar tape, which I applied after a few test rides, the whole conversion took less than three hours and less cost under US$300. What can I say? I'll be doing a riding piece here so you can read more about it. But, for sure, the 67ish inch gear works well for commuting and very well for trail riding. It's low enough to allow me to leg-lock the rear on dirt with ease. The bike is quick and nimble, and still smooth on dirt, leaves and grass. I can (and do) ride about 90% of the trails in my area--and I pedal every inch of the way. There are a few cruxes to cross when you take a fix on the trail, but the smiles you get are worth all the effort. Thanks in part to 63xc.com, I've got a regular dedicated fix now and I'm sure that this trail-tested bike will be around for a while. John 'Gonterian' Gonter resides in Burlington, Vermont where there are more fixed gear commuter bikes than anywhere he's ever seen. In August he will 'compete' in the 2005 SSWC on his Fixed Gear Vulture mountain bike. John has a piece in the How to section on log crossing. He wanted us to mention that his LBS is the famous Old Spokes Home.